How to use self storage. A short video on how easy it is to use Lok'nStore. So what’s inside the big orange building? Explore a typical Lok'nStore centre with over 700 units and learn more about how storage works. 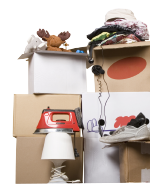 See the different sizes of storage units for yourself -- you'll be surprised how much stuff you can fit in. Why do businesses love Lok’nStore? Learn more about the flexibility, value and ease of access that makes us ideal for your business storage.